Miami, FL – The South Florida Water Management District (SFWMD) Governing Board on Thursday approved an update of the Lower East Coast Water Supply Plan, a blueprint to ensure there will be enough drinking water for the more than 6 million residents of South Florida's Lower East Coast region. 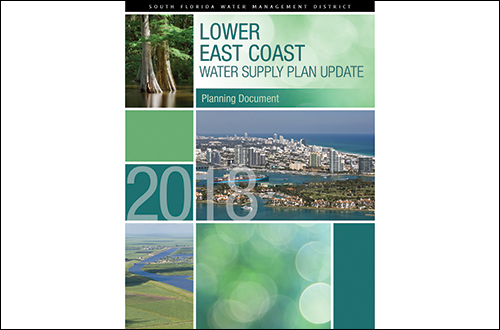 The Lower East Coast Water Supply Plan directly protects water sources in Palm Beach, Broward and Miami-Dade counties and parts of Monroe, Collier and Hendry counties for the next 20 years. "No one can predict whether Mother Nature will leave our District with a deluge of water or create a drought. That is important to remember when advocating for lower lake levels in Lake Okeechobee," said SFWMD Governing Board Chairman and Miami-Dade County resident Federico Fernandez. "The Lower East Coast Water Supply Plan considers Lake Okeechobee water essential to replenishing the region's drinking water wellfields and ensuring their water supply." The Lower East Coast's approximately 6 million residents, businesses, industries and agricultural operations use almost 1.7 billion gallons of water per day, so ensuring that resource remains vital to protecting life. SFWMD updates regional water supply plans every five years. The plans identify water sources in relation to water demand over the next 20 years. You can read the 2018 Lower East Coast Water Supply Plan Update at www.sfwmd.gov/lecplan.